Dr. Mohamed Muthiullah completed his MBBS from Madras Medical College, Government General Hospital, and Chennai, India in 2000. He completed MD in General Medicine from Stanley Medical College, Government Stanley Hospital in 2003. Subsequently he joined Madras Medical College, Government General Hospital, Chennai, India to obtain DM in Cardiology. After completing medical training, he entered Cardiology Clinical Practice in 2007. He is a member of the European Society of Cardiology and the Asian Society of Cardiovascular Imaging. Dr. Muthiullah has over 8 years of experience in clinical cardiology, cardiac and echo stress testing, holter monitoring and trans-thoracic echocardiography. 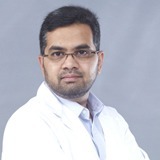 He was previously associated with KIMS Oman Hospital, Muscat, Oman and Sri Ramachandra University, Chennai, India. His special area of interest lies in advanced non-invasive multimodality cardiovascular imaging.